Eugene Onegin, Op. 24 "Waltz"
Serenade for Strings in C major, Op. 48 "II. Waltz"
Swan Lake, Op. 20 "Waltz"
Symphony #5 in E minor Op. 64 "Waltz"
The Nutcracker, Op. 71 "Waltz of the Flowers & Final Waltz"
Sleeping Beauty, Op. 66 "Three Waltzes"
One of the happier outcomes of Jean Martinon 's oft-maligned and too-brief tenure in Chicago was a fruitful relationship with composer/conductor Morton Gould. The two men apparently got along well enough that Martinon would allocate rehearsal time for Gould 's appearances. We tend to think of Martinon as an exclusively French music specialist – when we think of him at all – but apparently, he enjoyed popular chestnuts and was surprised to find that the orchestra had no repertoire list for such occasions. Though he enjoyed leading these "pops" concerts himself, he eventually ceded quite a few of those to Gould. 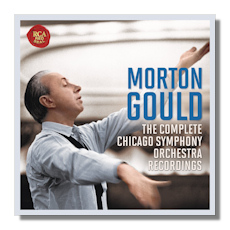 Although Martinon 's abrupt departure back to France effectively ended the Gould/Chicago relationship, we have these six discs to be thankful for. None of these discs are especially generous, since they all follow the "original jacket" concept that everyone should be tired of by now. But they all look and sound great, so maybe I 'm the only one bothered. As in the Martinon box, only the selection with Benny Goodman is less than essential. Also in common with the Martinon is an appreciably interesting range of repertoire, even more impressive considering the short time both men could work in Chicago. Compared to the rather conservative Fritz Reiner, there 's a good deal of music that would have been new to listeners in 1965-1968. To be frank, there 's a bunch of music here that isn't terribly familiar now. Sure, the Tchaikovsky waltzes are standard, but when was the last time you heard them played with such conviction and virtuosity? More than Reiner, and even more than Martinon, Gould understood when to relax and simply make music. But he understood how to make great music in a wide range of styles. Indeed, what 's so striking about this box is how serious the works are considering Gould 's reputation as a master of "light" music. The Ives, Nielsen, Copland, and Myaskovsky are all major statements by a world-class musician and orchestra. The Ives First won a Grammy, while the Nielsen is stunning and a perfect pairing with Martinon 's terrific readings of the composer with the same orchestra. It 's no wonder that they 've all been packaged together previously on CD. Perhaps the Rimsky-Korsakoff isn't the composer 's most essential music, but it 's fabulously played and well-recorded. The only "pops" selection aside from the waltzes is a bon-bon from one Fred Fisher. Gould was a masterful arranger. Everything else could serve as a cornerstone of your music collection, especially the Americana. It 's not like Solti, Giulini or Barenboim had much interest in this stuff, so it 's great to see Chicago in native music, so to speak. Finally, the small contributions of the Chicago Symphony Chorus are predictably excellent. A final thought: Martinon also brought Seiji Ozawa on board and he made a few important records in Chicago as well. It would be great to see his recordings pop up in this series as well, since some of them are (naturally) only to be found in Japan. But even if that never happens, we have this box. I 'm sure that most collectors thought it would never be released either, and so in all respects we owe our thanks to Sony Classical for this undeniably important snapshot of the Chicago Symphony Orchestra.